How's this for a novel gift idea for a loved one? Save and print the SMS, iMessage and WhatsApp conversations you have had with your loved one. Print all the messages of love you have expressed to each other over time and present them to your loved one in any manner you wish. iPhone users can do this with ease with TouchCopy, while Android users should check out Droid Transfer. Both apps allow you to save and print your phone conversations with a loved with ease. Conversations can be saved as PDF, text or html files, with all images sent in messages included, or they can be printed in a couple of mouse clicks. Please see the summaries on how to print off your SMS below. Detailed info on how to print SMS and WhatsApp conversations from your iPhone can be found in the TouchCopy support articles. Please see the Droid Transfer support pages for more info on how to print messages from your Android phone. Here is the step-by-step guide on how to print off conversations from your iPhone. Download TouchCopy to your PC or Mac. Run TouchCopy and connect your iPhone to your PC or Mac. Connect your iPhone to your Mac or PC using a USB cable. Wait for TouchCopy to detect and read your iPhone. Click on the Messages icon in TouchCopy. TouchCopy will copy all sorts of stuff from your iPhone but for now we are only interested in Messages. Click the Messages icon. Select your loved one from the contacts list. TouchCopy will display a list of all the contacts and groups you have had conversations with over SMS, iMessage or WhatsApp. Select your Valentine from the list. Click "Print" - TouchCopy prints the conversation directly to your printer! If you're using a Samsung, Google or another Android phone, use Droid Transfer to print off your messages. 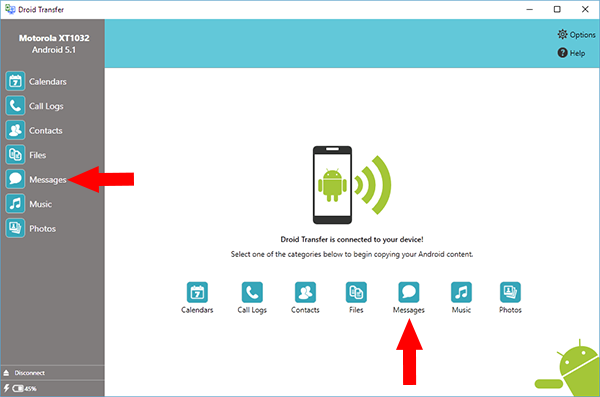 Download and install Droid Transfer on your PC. In Droid Transfer click the Messages icon. Droid Transfer will show all the text message conversations available on your Android Device. Select the conversations you want to print from the recipient list shown in Droid Transfer. Droid Transfer will print all the text messages and pictures you have sent and received. Find the best PDF to Word Converter for Windows 10. How to backup your iPhone with or without iTunes.